U.S. #296 – Issued in 1901 to commemorate the Pan-American Expo and World’s Fair in Buffalo, New York. President McKinley was assassinated at the fair, leading Theodore Roosevelt to become President. Touring New England on August 22, 1902, Theodore Roosevelt became the first sitting President to publicly ride in an automobile. Less than a year before, Roosevelt became America’s youngest President when his predecessor, William McKinley, was assassinated at the Pan-American Expo and World’s Fair. Roosevelt quickly became a leader in the Progressive Era and set about fulfilling his own political agenda. Roosevelt proved popular among the people and toured often. In August 1902, he took a yacht to New Haven, Connecticut and then embarked on a state-wide tour in a Columbia Electric Victoria Phaeton automobile. It was the first time a sitting president publicly rode in a car. An estimated 20,000 people lined the streets to catch a glimpse of the president and cheer him on as he passed by. Because of the maximum speed of Roosevelt’s car (13 miles per hour), his police guards couldn’t keep up with him on foot. Instead, they rode bicycles, effectively creating America’s first presidential motorcade. 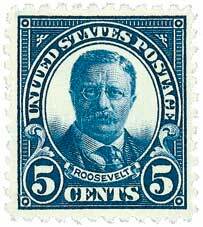 A pioneer and adventurer, Roosevelt had several other presidential firsts. These include the first to be submerged in a submarine, own a car, have a telephone in his home, and entertain an African American at the White House – Booker T. Washington. He also went on to become the first former president to fly in an airplane. 15 Responses to "This Day in History… August 22, 1902"
Love to have them. Interesting! I l this history about stamp s, good yay to start the day. ……. I enjoy reading what happened this day in history using stamps as the backdrop. Thanks Carl, neat info, never knew about all the “firsts” for a U.S.President!! Great story was surprised to read about McKinley ‘s assassination at the world’s fair.TR was a great president.He would turn this country upside down if he were president today. This is a great series of historical items. Some I know about, but even those I find new information from these posts. Thank you for this information. I was born and raised in Taberg, NY, about 6 miles south of Camden, and graduated from Camden Central School in 1964. Mystic Stamp was just a small business back then, but nevertheless, had an excellent reputation from the small town in Upstate NY. 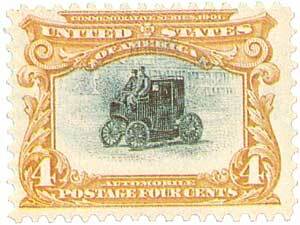 Your company has grown to be THE source of stamps for collectors around the world. Your posting of This Day in History, highlighting the important events from the past that are supported by stamps issued in commemoration is an excellent example of how you folks ‘think out of the box’ to provide the highest level of service to your customers. Congratulations and keep it up! That’s fascinating. I never knew that. Must be a fantastic Presidential motorcade . Wonderful story. Theodore Roosevelt is an excellent role model for our children. When I taught sixth grade reading, his life story was featured in the reading book. He is one of our heroes. Mystic is to be recognized for your love of American History. thank you. Where else would u find 8 firsts in a short synopsis. I like this series and enjoy it very much. My thanks to the creators of each article. Did you know TR also owned a ranch out west?